Crookham Travel provides day tours and longer holidays with Brewery Visits, Pub Tours, Preserved Railways, Tram Systems, Christmas Markets, River Trips, Coastal Cruises, City and Country Breaks in the UK and abroad. See the pictures above for some of our past activities. Established since 1977, we have, so far, organised more than 440 trips for over 38,000 participants! Please check our "Tours" link above. All tours start from London (unless stated otherwise) but some may be joined en-route. We are a Supplier Associate Member of SIBA – The Society of Independent Brewers - and were selected as Supplier Associate of the Year in 2017. A return to this friendly country has been on ice awaiting the refurbishment of the five rope- worked boat lifts near Elbląg. These are as unique as ours here in the UK and well worth experiencing. 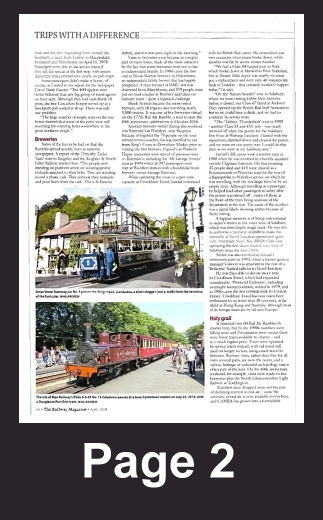 This, coupled with the rave reviews about the beer festival in Wrocław, plus a request for a return visit to Kraków, all make for a great summer itinerary in a country that is still very good value. We appreciate that some of you may not be able to spare the full ten days to enjoy the entire tour – if this is you, please discuss with me and your needs may be accommodated. · Wrocław is the home to the nation’s now annual beer festival. Such is its success that it outgrew its first location and is now held in the football stadium that has (unsurprisingly) very good tram and train links. Two Crookham Travellers have already enjoyed the venue which had 85 bars and food outlets in 2018. Entry is free. Apart from this event, the city offers magnificent townhouses, soaring medieval churches which tower over the old town on the other side of the river, upon which boat trips are available – plus five breweries / brewpubs which will be detailed in the AVB, some of which we will formally visit. · Kraków probably needs little introduction to you and we are lucky to have found a suitable hotel. The old town, 16th century Cloth Hall and main Market Square are well worth seeing. Since our last visit there has been an interesting extension to the city’s tram system. Additionally, the beer scene has improved markedly and in this beautiful city you will be able to find Polish-brewed cask ale served by handpump and we naturally will be organising visits. · Elbląg has a very complicated history which I will leave for the AVB to explain. It was part of the Hanseatic League and flourished there, not assisted by the construction of the Elblag canal in the1850s. It really is one of the seven wonders of Poland and lots of info can be found on-line (search for ‘Elbląg canal’ – there are many evocative pictures available). They also have a major regional brewery. 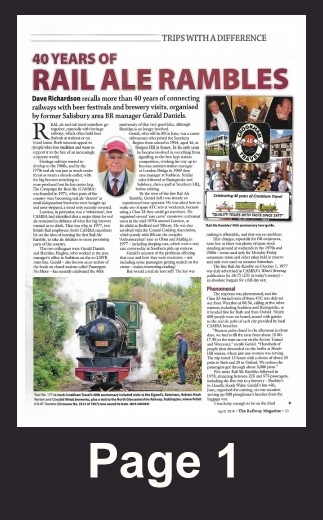 We were very pleased to see an excellent and informative article in the April 2018 edition of the Railway Magazine, “40 Years of Rail Ale Rambles” by Dave Richardson. 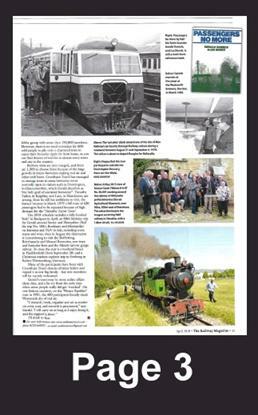 The Railway Magazine has been published in London since July 1897. As of 2010 it has been, for three years running, the railway magazine with the largest circulation in the U.K.